LFO: The voltage controlled LFO has the waveforms Triangle, Sine, Sawtooth and Rectangle available and features a Reset/Sync input. Triangle/Sine and Rectangle are displayed by means of dual-color LEDs (probably red/green), Sawtooth has a unicolor LED available (probably blue). The output levels are about -4V...+4V for Triangle, Sine and Rectangle. The Sawtooth level is about 0...+8V. The CV control can be switched to attenuator or polarizer ("CV Mode" switch). In polarizer mode the CV inputs affects the frequency in the reverse manner when the CV control is left from the center position. In the center position CV has no effect and right from the center the control works like a normal attenuator. The frequency range (without external CV) is from about 0,005 Hz (i.e. about 3 minutes per periode) to 200 Hz. In addition a ultra-low mode can be activated by means of an internal jumper. When the ultra-low jumper is set a fixed voltage is connected to the switching contact of the "LFO CV" socket. In polarizer mode of the CV control that way extremely low frequencies (up to one hour period and more) are possible. 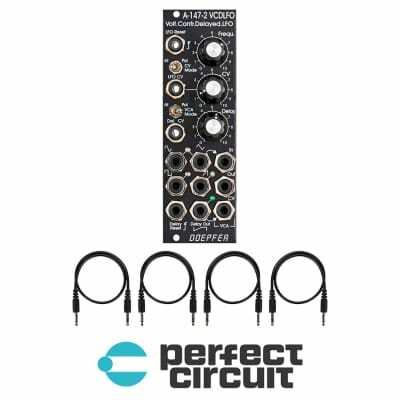 VCA: This is a linear VCA that can be switched to "normal" VCA (i.e. kind of a voltage controlled attenuator) or voltage controlled polarizer ("VCA Mode" switch). In the "normal" VCA mode amplification +1 is achieved with about +5V control voltage. In polarizer mode the amplification ranges from about -0.5 (i.e. inverted signal with about 50% level) with 0V CV to +0.5 (i.e. non-inverted signal with about 50% level) with +5V CV. With about +2.5V CV the signal is suppressed. Details about the functioning of a voltage controlled polarizer can be found in the description of the module A-133. In this mode the VCA can be treated also a DC coupled ring modulator (similar to A-114). The VCA of the A-147-2 has three sockets available: "In" (signal input), "Out" (signal output) and "CV" (control voltage input). The Triangle Output of the LFO is normalled to the VCA signal input by means of the switching contact of the "VCA In" socket. If another LFO waveform (or any other signal) should be processed by the VCA the corresponding signal has to be patched to the "VCA In" socket. 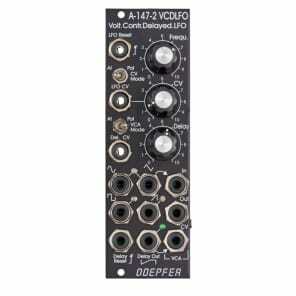 The VCA can be used also independently from the LFO and the Delay CV. In this case the VCA sockets In, Out and CV have to be patched accordingly. The VCA can be used also as waveshaper for the LFO signals (e.g. 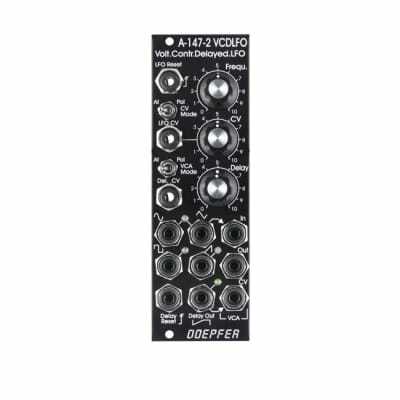 by patching VCA In and VCA CV to different LFO signals, if necessary via attenuator A-183-1 or offset generator/attenuator A-183-2). Attack/Delay: The third sub-unit of the module is a simple, voltage controlled envelope generator that has only the parameter "Delay" (or Attack) available. This unit generates a linear increasing voltage that starts from 0V after each Delay Reset until it reaches about +5V. Then the voltage remains at +5V until the next Delay Reset occurs. The inclination or gradient is controlled by the manual Delay control and the Delay control voltage ("Delay CV" input). The waveform is linear, the control scale is exponential. The output voltage is displayed by a unicolor LED (probably orange) and available at the "Delay Out" socket. The manual Delay control ranges - without external "Delay CV" - from about 5ms (fully CW) up to 2 minutes (fully CCW). By means of an external voltage applied to the "Delay CV" socket this range can be extended. A rising CV shortens the delay time (behaviour like a VCO) ! The Delay output voltage ranges from about 0V to +5V. The rising edge of the gate, clock or trigger signal applied to the "Delay Reset" sockets resets the Delay output voltage to 0 V.
"Delay Out" is normalled to the VCA CV input by means of the switching contact of the "VCA CV" socket and consequently controls the Triangle level provided that no other patch is made. A typical example is the usage of a Gate signal (e.g. from a USB/Midi-to-CV/Gate interface) as Delay Reset. That way a delayed vibrato or tremolo can be realized if the VCA output is patched to the frequency CV input of a VCO (or VCF), or the CV input of a VCA. 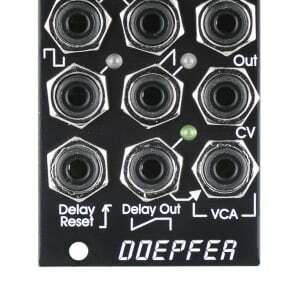 But the Delay sub-unit can be used also independently from the LFO and VCA, e.g. as a voltage controlled waveshaper or for other applications where a linear increasing signal with voltage controlled steepness is required.